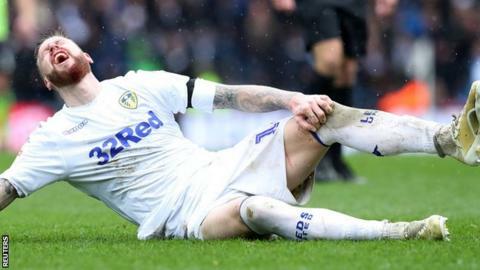 Leeds United centre-back Pontus Jansson will be out for three weeks after injuring his knee in their Championship defeat by Sheffield United on Saturday. The 28-year-old played on following the injury, as Leeds had already made all their changes, and ended the game in goal after Kiko Casilla was sent off. It means Jansson will sit out Sweden's European Championship qualifiers over the international break. He is also set to miss Leeds' next two games against Millwall and Birmingham. The Yorkshire side are third in the Championship, a point behind the second automatic promotion spot.